Our day begins with a visit to Stratford Upon Avon in Warwickshire. 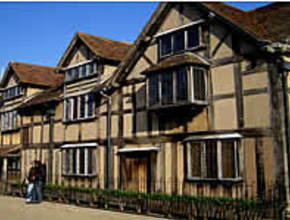 Known the world over as the birthplace of the great poet William Shakespeare we, quite rightly, take you to the house where he was born (entry included) and to Holy Trinity church where he was both baptised and buried. 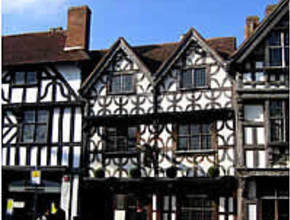 Many other centuries-old houses survive, some of these have associations with the writer. After a panoramic tour of the town and some free time we continue for a photo stop at Anne Hathaway's cottage, a beautiful timber-framed thatched farmhouse that was Shakespeare's wife's childhood home before travelling south through the stunning Cotswolds. Here we can find the little back roads taking us away from the busy highways. We meander down country lanes, through villages of honey coloured stone, passing Cotswolds Hills to Stow-on-the-Wold, Bourton on the Water (otherwise known as 'Venice of the Cotswolds') and Burford. A stop for a leisurely lunch is made in Stow-on-the-Wold. After the Cotswolds village drive we then we set off to Oxford, the home of oldest English speaking University in the world. The journey from the Cotswolds to Oxford is a little over 30 minutes and we then arrive in the 'city of dreaming spires'. Your visit begins with a guided walking tour amongst the cloisters and quadrangles of Britain's oldest University, founded in 1167 when King Henry II banned English students from attending the University of Paris. Ivy clad medieval college buildings compete for space with Georgian shops and ancient churches around busy streets which both 'Town and Gown' call home. 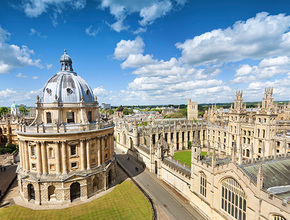 Our guided walking tour will take you into the heart of this land of hallowed academia, to the Bodleian Library, to the Radcliffe Camera, Sheldonian Theatre, Harry Potter film locations and University buildings. Entry is included to the Divinity School, built in 1488 for the teaching of theology. This splendid room is the University's earliest purpose built teaching room, and its first examination hall. With an elaborately vaulted ceiling and 455 carved bosses, it is a masterpiece of English Gothic architecture. After the guided tour there will be some free time to enjoy the city, before we depart Oxford and take the short drive to London. If you wish to change any part of your booking arrangements after our confirmation invoice has been issued, you must inform us, or your agent in writing as soon as possible. This should be done by the person who made the booking. Whilst we will do our best to assist, we cannot guarantee that we will be able to meet your requested change. Where we can meet a request, all changes will be subject to any applicable rate changes or extra costs incurred. If you make the changes more than 3 months before your departure, you will have to pay an administration fee of £50 for each person whose booking has changed, and any further cost we incur in making this alteration. You should be aware that these costs could increase the closer to the departure date that changes are made and you should contact us as soon as possible. If you make a change within ten weeks of your departure you may have to pay cancellation charges. You may be able to make changes to passenger names up to four weeks before departure at a cost of £50 for each name changed, however this is not guaranteed. Where a transfer to a person of your choice can be made, all costs and charges incurred by us as a result together with the appropriate amendment fee as set out above must be paid before the transfer can be made. Where we are unable to assist you and you do not wish to proceed with the original booking we will treat this as a cancellation by you and cancellation fees will be payable. If you have to, or wish to, cancel your booking, the party leader must immediately contact us or your travel agent and then confirm your cancellation. The day we receive your telephone notification of cancellation is the date on which your booking is cancelled. Since we incur costs in cancelling your booking, a cancellation charge will be levied as shown in the following table. Number of days before start date of your arrangements that notification of cancellation is received by us. Where any cancellation reduces the number of full paying party members below the number of free places and/or concessions agreed for your booking we will recalculate these items and invoice you accordingly. Please note that other service providers may impose higher cancellation charges. If the reason for your cancellation is covered under the terms of your insurance policy, you may be able to reclaim these charges.